Time waits for no man, not even those that work in the property market. When working in property it is important to make sure you show up on time and ready for the job in hand. This doesn’t just mean showing up to your meetings on time but making sure that your diary is in order to cope with all the demands that will be thrown at you. While working in property you will find that every second counts and your working week will be booked up with appointments in and out of the office, so you must be organised. If you know that you are no good when it comes to time keeping you might want to get some practice in before moving into a property career. If you are not very good in terms of punctuality it might be a good idea to set your watch and the clocks in your house a few minutes later than the actual time this way you will always be ahead and it should stop you from sleeping in or taking too long to get to work. Once you progress further up the career ladder you will find that you have an assistant or secretary that will look after your diary but until this point it will be down to you. You will need to make sure that you write as much as possible in your diary. You should always write your appointments in your diary as soon as they come up. You may think that you will remember you have the appointment on the day, but unless you write it down you will be likely to forget. You should be planning your diary week by week, so before you leave the office on Friday night and head off to the pub, you should make sure you have checked your meetings for the following week, so you can plan ahead. Travelling and getting out and about to meet various clients will be a big part of your job when working in the property sector. It is important that you follow a few golden rules to make sure that you get to your meetings on time. If you are working in the residential sector as an estate agent then time keeping will be of the upmost importance. If you need to show people around a property they are not going to wait thirty minutes for you to show up, they will simply go home and it could cost you a sale. Likewise, if you are working in the commercial property arena you will be expected to show up on time for appointments when you are surveying properties. If you fail to show up on time more than once you could get a name for yourself and your company which could put your job at risk. When travelling by car you should always check ahead and listen to the radio or traffic report to see if there are likely to be any disruptions on your journey, you should ideally check this the night before. It sounds obvious but you should always fill up on petrol the night before a meeting, you do not want to find yourself stranded in the middle of the motorway with no petrol and a client waiting for you. 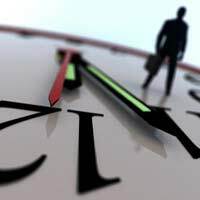 Good time keeping and punctuality will play an important part in your property career, if you can’t demonstrate good time keeping you will deter people from coming to you and your company again. So when working in the property market take a few minutes each day to make sure that your diary is in order and you have scheduled in all of your meetings, this way you won’t find yourself mimicking a white rabbit.